It’s taken almost 18 months since passage of citizen’s initiative 502 in November 2012 for the State of Washington to write rules, approve applicants and determine locations for the retail sale of marijuana for recreational use (medical marijuana was already legal in Washington State). Eventually there will be approximately 350 recreational-use pot stores throughout Washington State, but the state’s Liquor Control Board used a lottery to dribble out licenses to applicants with the first group opening on July 8, 2014. My pot-smoking days are decades behind me (mostly), but this is a historic event for the Pacific Northwest so I had to check it out. 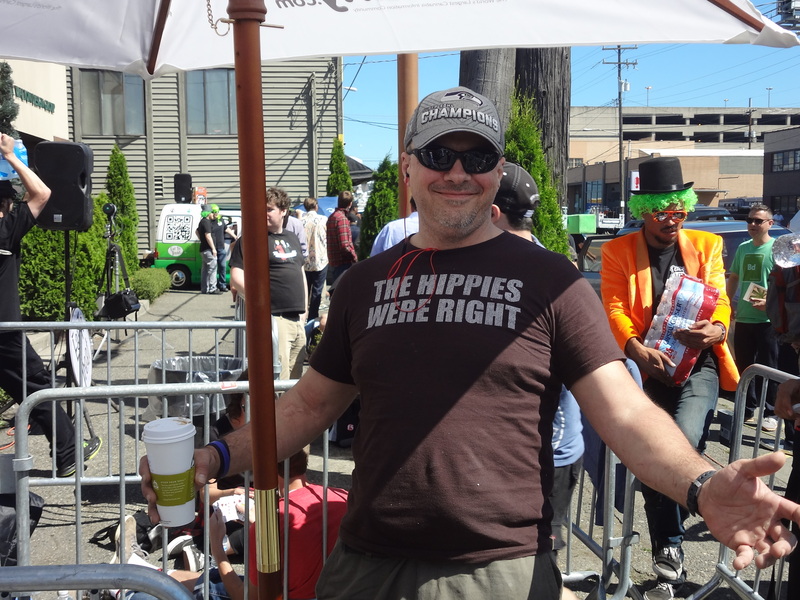 So, with the sun shining I headed down to Seattle’s gritty SoDo district (industrial area just south of the downtown sports arenas) where Cannabis City, the only Seattle-based lottery winner, was opening on July 8th. I arrived at 10 a.m. The local news stations were already there and a marijuana tour bus was parked across the street. About a hundred customers were milling around and I learned that the store wouldn’t open until noon and then only three customers would be allowed in at a time. By 11:00 the crowd had grown to several hundred, sweating in the afternoon sun, but light-hearted and happy while Cannabis City assistants handed out bottled water and a clerk from the nearby Subway sandwich shop took food orders for delivery to the line. Leafy, the cannabis information source, was selling T-shirts embossed with the names of your favorite strain of smoke and an occasional waft of spicy smoke indicated some were not first-time buyers. 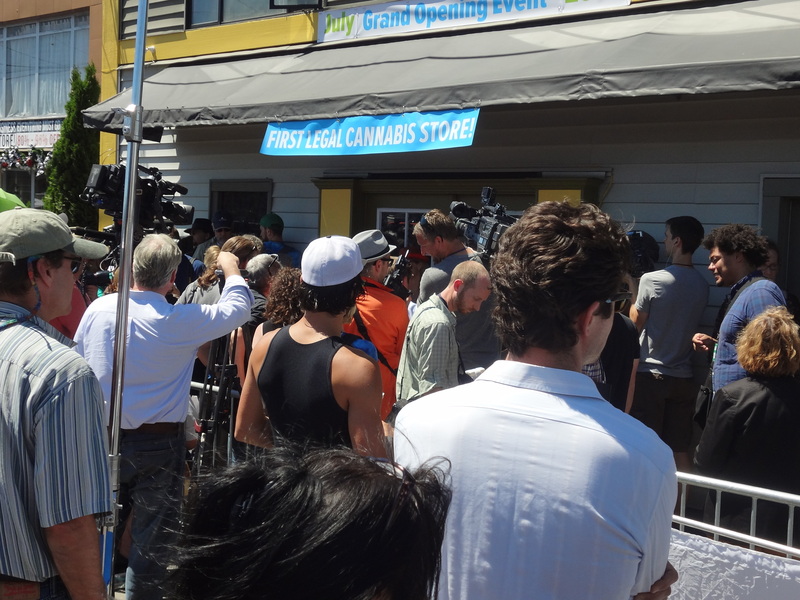 Finally the store owners announced over a loudspeaker that the first recreational marijuana store in Seattle had opened and the crowd cheered. But the line didn’t advance and by 1:00 I was in still waiting to enter. Obviously I wouldn’t reach the storefront for hours and thinking about Seattle’s rush hour traffic I left empty-handed but glad I had attended this historic event. Marijuana in Washington State: Marijuana consumers do not need to be Washington State or even United States residents but must be at least 21-years old. Sales are limited to an ounce of pre-packaged marijuana leaf per individual but most stores sell it by the gram (approximately $20/gram). Eventually marijuana cookies, brownies, etc. will be offered, but as of July 2014 regulations for these “edibles” were still being worked out. In addition to bulk leaf for smoking, there is a variety of marijuana products including hashish oils, edibles, tinctures and various concentrates. Washington regulates marijuana like alcohol (no public consumption) and even many highway road signs now read “don’t drug and drive” instead of “don’t drink and drive.” But, since bars and clubs aren’t permitted for pot-smoking, that leaves your home as one of the few places to legally consume otherwise legal pot (not that this stops smoking at parks, concerts and events around Seattle as the ever-present spicy aroma of pot attests). Even before the first gram of recreational marijuana was sold a horde of new businesses have sprung up around legalized marijuana including pot-attorneys, growers and suppliers, quality-control laboratories, pot tour companies, and a host of vendors for marijuana-related products and equipment.